The official registrations and financial information of The Philadelphia Jewish Voice may be obtained from the Pennsylvania Department of State by calling toll-free, within Pennsylvania, 1-800-732-0999. Registration does not imply endorsement. 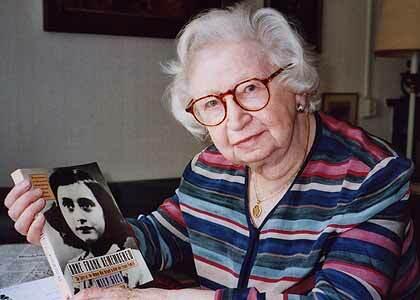 Miep Gies with her memoir, Anne Frank Remembered. Miep Geis died at age 100 on January 11, 2010. (New York Times obiturary) If your response is “Who?”, you are certainly not alone. Miep Geis was not a household word, but her deeds were legendary. Ms. Geis was the last of the group of Dutch women who helped hide and sustain the family of Otto Frank, her former employer, when the Germans occupied Amsterdam in 1942. When the Frank family was taken away, Geis found a diary kept by Otto’s daughter Anne. She hid it for years, thus preserving the story of the young girl whose name would become known the world over even though Anne never returned from the Bergen-Belson concentration camp where she died just shy of her 16th birthday. Her sister, Margot, died there as well. According to the press release from the Anne Frank Museum in Amsterdam, Meip Geis was awarded the Yad Vashem medal from Israel, a knighthood from the German government as well as one from the Netherlands. Even so, Ms. Geis eschewed the label “hero.” “I’m not a hero’, she once said, “It wasn’t something I planned in advance; I simply did what I could to help.” Others would disagree. In 1987 Miep Geis published her own memoir, Anne Frank Remembered, in which she revealed that she had not read the diary prior to its publication. In an interview with the Anne Frank House in 1998, Geis said, “It's a good thing I didn't [read them] because if I had read them I would have had to burn them. Some of the information in them was dangerous." In her later years, Geis spoke at numerous conferences and gatherings about her wartime experiences and vehemently debunked the Holocaust deniers’ claims. The death of Miep Geis generated a worldwide response. Her life was an example of the best human beings are capable of: courage, selflessness, compassion and loyalty. It was all the more remarkable in a time and place where evil lived. She will be remembered as one who epitomized the goodness so valued by her young friend, Anne Frank. A one-minute video of Miep Geis can be viewed on the BBC website. An audio tape of an interview with David Barnouw from the Netherlands Institute for War Documentation is available at Netherlands Radio Worldwide. © 2009. Permission is hereby granted to redistribute this issue of The Philadelphia Jewish Voice or (unless specified otherwise) any of the articles therein in their full original form provided these same rights are conveyed to the reader and subscription information to The Philadelphia Jewish Voice is provided. Subscribers should be directed to http://www.pjvoice.com/Subscribe.htm.